When you’re creating your entertainment and game room, you want to choose comfortable, attractive furniture. You also want it to be robust and long-lasting, so that your family and friends can enjoy years and years of quality time together. From tables and chairs to entertainment units and storage, we carry a great range of Amish real wood furniture designed with your entertainment equipment or gameroom in mind. The advantages of high-quality, American-made hardwood Amish furniture are many, and the furniture you buy today can be passed on to your children and your grandchildren, thanks to the time, effort and tradition our Amish craftsmen put into each and every piece. We would like to take the time to explain to you all of the great options we can provide you for your gaming and entertainment furniture, which include TV units, stereo units, storage pieces, tables and chairs. Many of our units include a variety of shelves, drawers and cabinets to give you the most flexibility in storage options. 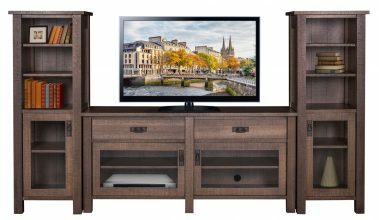 As with all of our beautiful Amish-made furniture, our solid wood entertainment consoles, media cabinets and other gameroom pieces are all available in a variety of hardwoods from the Northern United States. Choose from gorgeous woods like oak, maple, cherry and hickory for many of our pieces. You can also choose the stain from more than a dozen choices, ranging from light to dark. This allows you to customize your entertainment and gameroom furniture exactly the way you want it, and provides a long-lasting, durable finish that protects against wear and discoloration. They say that beauty is only skin deep, but we would politely beg to differ. We use only natural hardwoods in our traditional Amish furniture, and the beauty of the grain goes right to the heart of every piece of wood. Our craftsmen choose each piece carefully, to ensure a harmonious grain and pattern for your furniture. Even the parts you don’t see, like the backs of cabinets and the undersides of chairs, are made from true, authentic hardwood. We never use laminated or composite “wood” in our furniture, because these substandard materials don’t have the beauty and durability of honest-to-goodness natural wood. Amish artisans have been crafting furniture from American lumber for over a century, and know and trust a solid piece of wood. Even the techniques for joining and assembling our wooden cabinets, units and consoles is superior. Using things like dovetail joints, glue and nails, along with quality fasteners and hardware, is the only way we know to build furniture! We leave the shoddy clips and fasteners to the mass-market producers who build their furniture as cheaply as possible, with no thought as to how long it will last. These low-quality, low-cost items are designed to be churned out of a factory at high speed, and made to be packaged flat and assembled later. With traditional Shaker and Mission style Amish furniture, we take care of the assembly for you. We know that you’ll want to keep your entertainment and gameroom furniture for years, so we don’t make it to come apart. These units come in many different sizes, for all types of TVs. You can use them with modern flat-screen TVs, or deeper traditional models. Choose from flat or corner units, depending on the layout of your room. You can also choose your unit depending on your desire for different space and storage (including shelves, drawers and cabinets). Our stereo units are designed with multiple shelves for all sorts of audio equipment. We leave openings in the back to pass your wires and cables, keeping them safe and out-of-sight. Several models include glass doors, to keep dust off of your expensive stereo equipment. We can also incorporate various storage solutions (for CDS, cassettes, records, and more). Are you a fan of checkers or chess, playing card games or poker? Our beautiful games tables feature an integrated checkerboard pattern. Even if you don’t play checkers or chess often, the design is attractive and adds to any room. A tall height makes our games tables comfortable to sit at, so you’ll have no problem enjoying hours of family fun. To go with our games tables, we have lovely chairs designed to match, both in style and height. You can choose from many different woods, stains and seating services, to truly customize your chairs. You might want to pick up four for the table, and a few others for folks who like to watch the action around the games table! On top of all of these great Amish hardwood entertainment and games room furnishings, we also carry a huge range of additional items like bookcases, shelves, consoles, tables and storage units that you will also find useful. And because we make all of our wooden furniture with the same material choices, stains and construction methods, it’s easy to mix and match from different collections and furnish your games room exactly as you’d like. What makes our furniture so different from all the mass-market products out there? It’s the pride, effort and experience we put into every piece. Rap your knuckles on a traditional Shaker table or cabinet, then do the same on an item from a big-box furniture supplier. You can hear and feel the difference. Now, grab a chair of each type and try to lift them up. Our solid Amish hardwood chair can’t be confused with a flimsy laminate wood chair that comes in a box and is assembled with a handful of cheap screws. You can feel the quality of the solid wood chair, not to mention the inherent beauty of natural woodgrain, carefully sanded down and enhanced with deep, luxurious stains. You can also enjoy your American-made entertainment and games room furniture knowing that hardworking Amish craftsman enjoy rewarding employment doing the work they love. The same can’t be said for cheap, mass-market furniture that’s manufactured in countless low-cost countries the world over. To purchase wooden furniture from us is to support a proud American company, and encourages the continuation of a respected and beloved tradition of home furnishing fabrication. You can place your order directly on this site by clicking on the items you like and choosing your wood, stain and other options. If you need any help or have any questions, you can always send us an email or give us a call. We’d be glad to talk more about our collection of Amish entertainment and games room furnishings, and help you choose the perfect pieces for your home.